Bed and breakfast in Blackpool. Blackpool is the UK premier seaside resort with its "Golden Mile" of piers, fortune-tellers, amusement arcades, tram and donkey rides, fish and chip shops, candyfloss stalls, fun pubs and bingo halls. There are 7 miles of wide sandy beach backed by a chain of hotels and guest houses. The major event is Blackpool's Pleasure Beach on the South Promenade, billed as "Britain's biggest tourist attraction" with over 7 million annual visitors. Between the Central and North piers stands the 518ft Blackpool Tower, the North-West's own Eiffel Tower, built in May 1894, which offers rides to the top and a visit to the Edwardian ballroom. See Blackpool & Blackpool attractions. If you are in the right town but cannot find the accommodation you want on this page, you might consider Blackpool hotels & self catering accommodation in Blackpool. 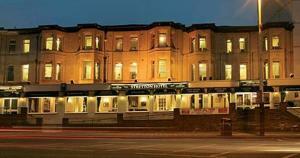 The hotel has a quiet location, on Blackpool's Promenade, looking out to sea. It has free Wi-Fi, free parking and refurbished rooms. There is easy access to the town centre by bus and tram. The North Grange is in a quiet area of Blackpool called Bispham. It is at the northern end of the Blackpool Illuminations, 2 miles north of Blackpool tower and a mile from Cleveleys. The large and light en suite rooms have been fully refurbished and have TVs, luxury beds and tea/coffee. Some rooms have sea views. The North Grange also has a sun lounge and a lounge bar offering an evening bar menu. The 2 dining rooms are decorated in a French-cafe style. Bispham tram stop is across the road, with frequent services to Blackpool town centre. Just 2 minutes' walk from Blackpool Beach, the relaxed and homely Glenheath Hotel has a family-friendly location. The town centre and Blackpool Tower are about 5 minutes' walk away. Glenheath Hotel has a well-priced bar and a comfortable sun lounge with a TV and leather sofas. You are free to come and go as you please, with no curfew. Each bedroom has a digital TV, fresh towels, storage space and free wireless internet access. A tasty full English breakfast is served in the dining room, and early breakfasts can be arranged. The trams are about 2 minutes' stroll from Glenheath, and Blackpool's bars, pubs and the Syndicate Superclub can be reached on foot. The famous Funny Girls show is at the end of the street. Just off the seafront, Oban House is a family-run hotel with free Wi-Fi. There is a complimentary coach service to Blackpool's train and coach stations, or the airport. Each en suite room at Oban House has a flat-screen digital TV with Freeview channels, and tea/coffee facilities. Good home-cooked food is served in the dining room, with a choice of menus. Oban House Hotel has a lounge bar, hosting live entertainment on some evenings. Oban House Hotel has some free parking, with space for 2 cars. The hosts are friendly and welcoming. Opposite Blackpool Pleasure Beach, this small, family-run guest house has clean, modern bedrooms, and a full English breakfast in the morning. The welcoming Seaforth Guest House is in a quieter area of Blackpool, a few minutes from the seafront, piers and Pleasure Beach Train Station. The South Promenade and sandy beach are a few minutes' walk away, and the town centre and Blackpool Tower can be reached by tram or bus. Limited free on-site parking can be reserved at Seaforth Guest House, and evening meals can be served on request. With your own key, you can come and go as you please. Group bookings or stag and hen parties are not accepted. On New South Promenade, overlooking the beach, the Kenilworth Hotel is just 300 metres from Blackpool's Pleasure Beach. It has free parking, a bar and some rooms with sea views. The rooms have modern decor and an en suite bathroom. All have free Wi-Fi, Freeview TV and tea/coffee. Many rooms have stunning sea views. The Kenilworth has a licensed bar and a dining area. An early breakfast can be arranged from 06:30 on request. Blackpool Pleasure Beach Railway Station is 400 metres away. The South Pier and the Sandcastle Waterpark are both within 12 minutes' walk of the Kenilworth. Trams and bus stops on the Promenade are both within 100 metres of the hotel. A 5-minute walk from the town centre, this family-run hotel offers free Wi-Fi, good breakfasts and free parking. Blackpool North Train Station is a 2-minute taxi ride away. The Moorfield is 10 minutes' walk from Blackpool Tower, The Winter Gardens and The Sea Life Centre. With a relaxed, friendly atmosphere, Moorfield Hotel offers en suite rooms with tea/coffee and a TV. Within a 10-minute walk you can find the Hounds Hills Shopping Centre, along with restaurants and pubs. Blackpool's Pleasure Beach is a short tram ride from Moorfield Hotel. Adjacent to the Promenade in the fashionable and quieter North Shore area of Blackpool, the small 3-star Inglewood is all en suite, licensed and open all year. Double-glazed and centrally heated, The Inglewood is well-known for its meticulous cleanliness. All rooms are serviced daily and feature comfortable beds. A full English breakfast is included in the room rate. Most attractions, including the Pleasure Beach, Sandcastle, Winter Gardens, Blackpool Tower and all 3 piers are within walking distance. With a tram stop just 2 minutes away, nobody needs to walk far. The train station, bus station and airport are easily accessible, as are Blackpool's town centre, the football ground and the North Shore Golf Course. With free Wi-Fi, free parking and refurbished rooms, Homecliffe is in Blackpool's North Shore, about 100 metres from the sea and 0.8 miles from Winter Gardens. The Homecliffe Hotel has rooms with flat-screen TVs and power showers. The mini-suites have a spa-bath. Theatres and shops are within walking distance. Trams stop close by and run to Pleasure Beach, Blackpool Tower and South Pier. A speciality Homecliffe breakfast is served every day, and a 4-course evening set menu is served from Monday to Saturday. The hotel also has a spacious bar area and a sun lounge. This family-run hotel is just off the seafront promenade, on Blackpool's North Shore. It has free parking, a bar, a sun lounge and en suite rooms with Freeview digital TVs. The Croydon is 30 metres from the beach and 1.5 miles from Blackpool Tower. There is a tram stop 30 metres away and the shops, bars and restaurants are a 5-minute tram-ride away. 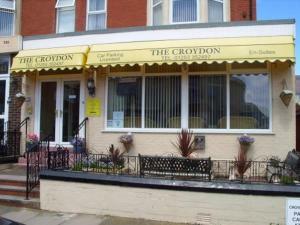 The Croydon has a family bar, a bright sun lounge and a pretty garden with sea views. There is a children's area with a Playstation and games. Each room has a TV, shower and tea/coffee. A full English breakfast is available each morning in the large dining room. There is off-road parking for 6 cars. Ideally located in Blackpool's peaceful North Shore area, close to the beach, this small, family-run B&B provides 11 comfortable guestrooms within a homely, welcoming atmosphere. The perfect choice for a quiet stay, or just a place to use as a base whilst you take in some of the delights of Blackpool, the New Kent B&B offers a range of facilities, including wide selections of beverages in the bar and free wireless internet throughout. Although it is only small, the New Kent is slowly gaining a reputation for the quality of its service and the intimacy of its atmosphere. We provide many cordial amenities and the breakfast is certainly something to relish! In the heart of Blackpool, the clean and friendly Aindale has 24-hour access and a late bar, and is 5 minutes' walk from the beach, Blackpool Tower and Winter Gardens. The owners provide helpful service and serve a good hot breakfast. Large, modern en suite bedrooms feature a TV with DVD player, free Wi-Fi and an iPod dock. Ironing facilities, hairdryers and hair straighteners are available at reception. With a focus on style and budget, Aindale is well-located for the shops and nightlife in the town centre. A short tram ride down the Golden Mile will bring you to Blackpool's Pleasure Beach. A public car park is about 50 metre away. This friendly, family-run hotel offers free Wi-Fi, generous breakfasts and free parking. The seafront promenade and Blackpool Tower are a 5-minute walk away. Each homely en suite room at Lanayr Hotel Blackpool has a digital TV, a DVD player and tea/coffee. The bar is open every day and Lanayr Hotel has a dance floor. A varied dinner menu is served in the large restaurant. Within a 10-minute walk of Lanayr Hotel are the Winter Gardens, the piers, the beach and nightclubs. 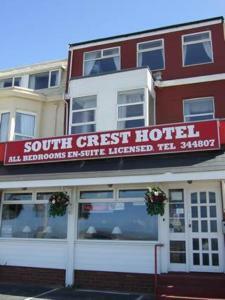 A 2-minute walk from the Pleasure Beach, this family-run hotel offers free parking, good breakfasts and free Wi-Fi. Blackpool South Rail Station is nearby. Each room at the Wilmar features a digital TV with Freeview channels and tea/coffee facilities. Wilmar has a fully-licensed bar offering an extensive drinks menu, along with bar snacks and karaoke facilities. The Wilmar hotel is close to the local bus station. An AA 3-star hotel, Wilmar's hosts are friendly and welcoming. 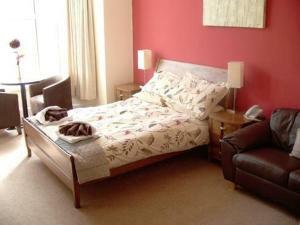 Phoenix Guest House is small, friendly and central, just yards from seafront parking. Enjoy sea views from the garden, dining room and 1 family room. The main attractions are 10 minutes away, including theatres, clubs, the cinema, central pier, Blackpool Tower and the Winter Gardens. It is a short tram ride to the Pleasure Beach, Sandcastle Water Park and South Pier on the South Shore. Even with these locations close by, you can still enjoy a peaceful night's sleep, as Phoenix caters for families, couples and small groups only. Phoenix Guest House cannot accept pets, groups aged under 25, or hen/stag parties. Close to Winter Gardens, Hounds Hill shopping centre and Blackpool Tower, this charming hotel with bar offers full English breakfasts and helpful service. Rosebank Villa is in the centre of Blackpool, a short walk from the Promenade and Central Pier. Theatres, nightlife and shops are easy to get to. The renovated family-run hotel is a hotel for families, couples and small groups only, and offers free Wi-Fi and Freeview TV in the comfy bedrooms. Rosebank Villa can arrange a shuttle service from the train station, airport and local venues at evenings and on weekends. This family-friendly hotel is right on the seafront promenade, looking out on to the Irish Sea. There is free on-site parking for 10 vehicles. All rooms at The Bromley Hotel are en suite, with Freeview TV channels, tea/coffee and toiletries. Free Wi-Fi is available. Some of the rooms have sea views. The lounge at The Bromley has a TV, DVD player, dining table and leather sofas. As The Bromley Hotel is a family-friendly establishment, most of the rooms are suitable for families. Situated just minutes away from the promenade opposite South Pier, this small, family-run hotel presents itself as a comfortable base for your stay in the popular seaside resort of Blackpool. Within a short walking distance you can find the Sandcastle and the world-famous Pleasure Beach. The hotel is also on the route of a frequently operated bus service to the town centre. St Elmo also has a lift to all floors and a ramp at the entrance to ensure wheelchair accessibility to all public areas. This family-run hotel is on Blackpool's South Shore, opposite Blackpool Pleasure Beach and 900 metres from Sandcastle Water Park. It has free Wi-Fi, free parking, a bar and en suite rooms. The Elmfield offers bed and breakfast accommodation in en suite rooms. The double-glazed rooms have heating, flat-screen TVs with Freeview, radio alarms and tea/coffee. A full English breakfast is served each morning and 4-course evening meals are available by prior request. The bar area has a TV and a pool table. The sun lounge has views of the Pleasure Beach Blackpool. Bar meals and snacks are served from 12:00 to 21:00. Blackpool Pleasure Beach Rail Station is 400 metres away. The hotel offers comfortable en suite accommodation in a great location, just 5 minutes' walk from Blackpool town centre, the Winter Gardens, the Grand Theatre and the famous Blackpool Tower. The hotel has 17 en suite rooms, including double, twin, triple and family rooms. All of the comfortable rooms have a colour TV and tea/coffee making facilities. Oriental cuisine is available from the Chinese takeaway at Bramlea Hotel. The hotel's convenient location means that all of Blackpool's shops, amenities, sights and bars are within easy reach. With the hotel as a comfortable, relaxing base, you can explore all that this vibrant seaside resort has to offer. The Bramlea Hotel's aim is to be a warm and friendly hotel with a comfortable and homely atmosphere, where guests feel they can ask us for any help or assistance they might require. Less than 5 minutes' walk from the Pleasure Beach and the train station, this well-maintained 1930s Art Deco-style building offers en suite rooms, free Wi-Fi and guaranteed free parking. On Blackpool's South Shore, The Corona has a Mediterranean and Spanish theme, with tiled floors, palm trees and marbled pillars. It is a short stroll from the seafront promenade and the trams. All en suite rooms are serviced daily and have a TV, tea/coffee, heating and double-glazed windows. A good breakfast is served in the morning, and for the evenings there is casual dining, with a children's menu. There is a spacious bar and an airy conservatory where you can relax. On the South Shore, Silversands has free parking and rooms with free Wi-Fi, by the promenade. The Pleasure Beach is opposite Silversands. Silversands Hotel has live entertainment, along with a fully licensed bar, a TV lounge and a dance floor. Traditional evening meals are bookable, and are served at 17:30. Each en suite bedroom at Silversands Hotel has an LCD TV with Freeview channels and tea/coffee. Most rooms have sea views. Blackpool Pleasure Beach Railway Station is across the road. Bus and tram stops are within a 2-minute walk. This comfy, clean, good-value hotel is in South Beach, next to Pleasure Beach, Sandcastle Water Park, trams, the pier and all attractions. The hotel has free parking. Clifton Court Hotel has Pirates Rum Pub for cold beers, and the Banthai Lounge with free hot drinks. With a 2-star 'Metro Hotel' rating from Visit Britain, Clifton Court Hotel has en suite rooms with Freeview TV, DVD player, an iPod dock and bottled water. Pleasure Beach Rail Station is next the hotel, and Blackpool Airport is 2 minutes away. With an indoor pool, nightly entertainment and 2 bars, Sheraton Hotel is a family-owned property on Blackpool's Queens Promenade. It has great views of the Irish Sea. Each en suite bedroom has a flat-screen LCD TV with Freeview channels, and a beverage tray. Many rooms have sea views. On site, the Sheraton also has a sauna, lifts to all floors and a games room. 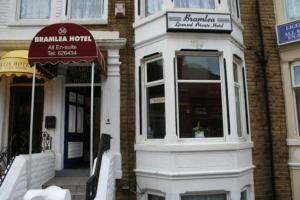 The hotel is well-located for Blackpool's shops and nightlife, and has free parking. 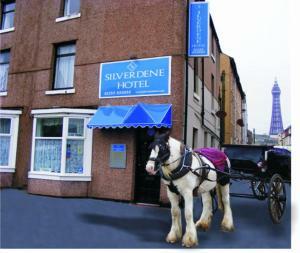 Just 300 metres from Blackpool's Central Pier and near the town centre, Silverdene is family-run guest house. There is a well-stocked bar and the rooms have TVs and DVD players. The cosy guest lounge at The Silverdene has a large-screen TV and karaoke. A full English breakfast is freshly cooked to order. The Silverdene Hotel is in a quiet residential area of Blackpool, just 5 minutes' walk from Blackpool Tower and the shops of the town centre. The beach and the seafront are just metres away. Just off Blackpool's promenade, the family-run Bluebell Hotel offers good breakfasts, a large bar and free parking. Blackpool South Rail Station is within a 10-minute walk. The en suite bedrooms at Bluebell Hotel have tea/coffee, a TV and a hairdryer. Evening meals are available on request. The Pleasure Beach and Central Pier are a 5-minute tram ride away, from the nearby tram stop. Bluebell's hosts are friendly and welcoming. There is a small exercise room for guest use.